As promised, I will continue to write about characters that remind me of myself to honor myself throughout my birthday month. Hey, if you don’t honor yourself, who will, you know what I mean? I don’t even know if that’s a thing, but it is so early and I cannot fall back asleep, so I’m just going to roll with it. This week is actually the week of my birthday (Saturday!) so what better character to write about than Rachel Karen Green? Besides the fact that Friends is my favorite show of all-time (okay, okay, I dunno–tied with The Simps), Rachel is my favorite character on the show. For a long time, Ross held steady in the top spot, but as I have entered the actual age of the characters on the show, I find myself eerily similar to Rachel. Thank god I don’t have a rich dad who spoiled me growing up, or there would be basically no difference. Sigh, I will be sad when I have run out of Friends to write about! 1. Being ditzy doesn’t make you dumb. I love the character development of Rachel. There are so many times she could have easily been chalked up to like a “dumb blonde” type of girl (though I know she’s not exactly blonde) but she has so much more depth to her personality than that. She is clearly not as book-smart-smart as Ross, but she could never rightfully titled “dumb.” I love this because I pretty much feel exactly that way about myself. I am a smart young woman, but I would probably be insulted if someone suggested that I was book-smart, and I certainly have more moments than I can count where I don’t know something that everyone else knows. Like pretty much anything about anatomy, or animals, or like…anything having to do with science. Or geography. When Ross makes his cruel pros and cons list about Racheml, one of the offending marks against her is that she is “too into her looks.” I am the first person to defend being “too into” one’s looks. First of all, I think appearance is very important. The way you present yourself to the world speaks volumes. I don’t care if you like makeup or don’t, or if you have short or long hair, it still applies. Rachel is very pretty (DUH) and I think I’m pretty too (which I think is okay to say) and I don’t think there is anything wrong with making sure you look good every day. Dressing up and feeling good about yourself is one of the best things anyone can do for him/herself, so SHUT UP, ROSS. YOU JERK. 3. It’s okay to be jealous. I am starting to realize that I am slowly trying to peg myself as the expert on jealousy, but I don’t even care. I feel super passionate about the jealousy thing. I am always encouraging people to recognize and even sometimes embrace their feelings of jealousy. No, I don’t think anyone should do anything crazy because they are jealous, but I do think acknowledging jealousy and even finding the endearment in it is important. I remember the first time I was jealous ever in my life. For years and years I was the girl who was never jealous of other girls because I had never met someone who I felt threatened by. The men I liked always liked me, so what was there to be jealous of? And then, this boy I was totally in love with, had me wrapped around his stupid extra tiny little finger and he knew it and even though we had been kind of a thing, he was openly all over this girl who came to visit our mutual friends. Now, I hate this about myself, that I didn’t like this perfectly nice young woman because of a dumb boy, but it was true. I wanted to kick her out of my town and our lives. She was my nightmare: tiny, blonde, Christian, tattooed and super hip with a cigarette and a Pabst and she still looked adorable with that little button nose. To make a long story short, I had a lot of red wine in a very little amount of time with basically no food in my stomach, obviously got sick, and still refused to leave the party because I was so worried that this boy was going to fall in love with the cute hipster girl. The conclusion I shall save for my memoirs, and I shall continue on about the real Rachel. I love when Ross and Rachel get jealous of each other’s respective love interests, and the times in which I feel most kindred to Rachel are, as I like to call them, The Julie Days. I love Rachel when Julie is around because she doesn’t even just get crazy jealous of Julie and Ross, but she gets mad at Monica too. I once told my guy friends that my ex could date whoever he wanted, but they weren’t allowed to like her. It’s somehow way worse when your friends like the new chick, ugh. 4. Loving your girlfriends is important. Rachel’s relationships with Monica and Phoebe, separate and as a trio, are the greatest. I am a girl who loves her girlfriends more than everyone else in the world, and I love seeing Rachel treat her girlfriends with as much love and passion as she treats anything else in life. I totally judge people on their friendships. Don’t trust women that don’t have close friendships with other women. 5. Loving your boy-friends is important, as well. …even if they all fall in love with you. I have a lot of guy friends, and I know that at least the married and the gay ones are not in love with me. 6. It’s okay to cry. Joey: He made Rachel cry! Rachel: (Crying) That’s not true! Hey, in case you haven’t read anything I have ever written, I cry a lot. I think crying is healthy, and I like when something evokes enough emotion in me to bring on the waterworks. I basically dislike movies and books that don’t make me cry cause what was the point? 7. Never call anyone drunk ever. 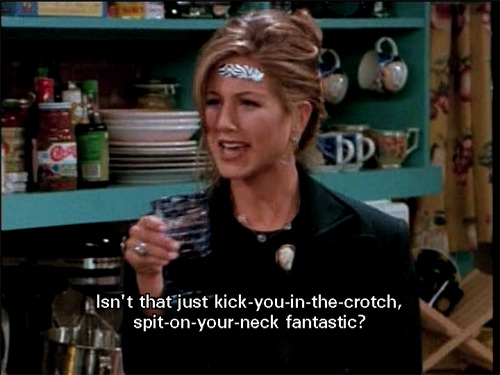 You know when Rachel gets really drunk on her date and rambles on and on about Julie and Ross getting a cat? And then her poor date tells her she needs closure, and naturally she thinks that getting closure is as simple as calling Ross’ answering machine and telling him that she’s over him because it makes perfect drunk sense, right? Been there, done that, only in the form of text messaging. Basically, if I am ever going through anything complicated or emotional or both with a man, I should just leave my phone at home when I go drinking. I have luckily avoided total catastrophes, but…just barely. 8. Turning 30 doesn’t have to be all that scary. And when I say “30,” I mean “26.” Pretty much guaranteed that I’ll freak out when I turn 30 ala Rachel. Rachel: So, if I wanna have my kid when I’m 35, I don’t have to get pregnant until I’m 34 which gives Prada four years to start making maternity clothes! Oh wait, but I do want to be married for a year before I get pregnant…No, so I don’t have to get married until I’m 33! That’s three years, that’s three whole years! Oh, wait a minute though. I’ll need a year and a half to plan the wedding, and I’d like to know the guy for a year, year and a half before we get engaged… Which means I need to meet the guy by the time I’m thirt…y. I started to say something similar to this today, actually and then freaked out that I am turning 26 on Saturday, which means I only have four years until I turn 30, and oh my god I’m going to start hyperventilating. 9. Cut your hair off! It’s fun! I do that a lot too, and I would show you pictures but that’s just really annoying. Mostly for me because I don’t want to go through all of my pictures. 10. Get off the plane. Because there is nothing like making sure you don’t let your true love get away. Featured image via goodreads, Julie image via fffriends.tumblr, Joey and Rachel image via primitivescrewheads.net.